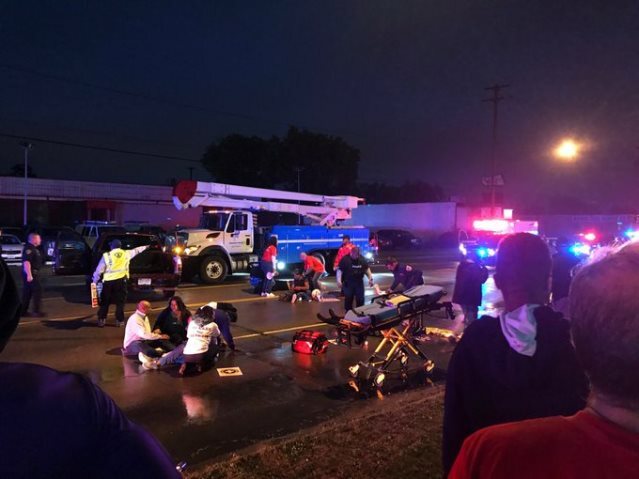 DETROIT – Twenty fast-food and other service workers were arrested with U.S. House candidate Rashida Tlaib at a downtown McDonald’s Tuesday afternoon, where more than 1,000 workers in the Fight for $15 converged to support striking cooks and cashiers’ demand for union rights. The strike in Detroit came hours after Amazon announced it is raising pay to $15 an hour nationwide, marking the latest victory by the Fight for $15. 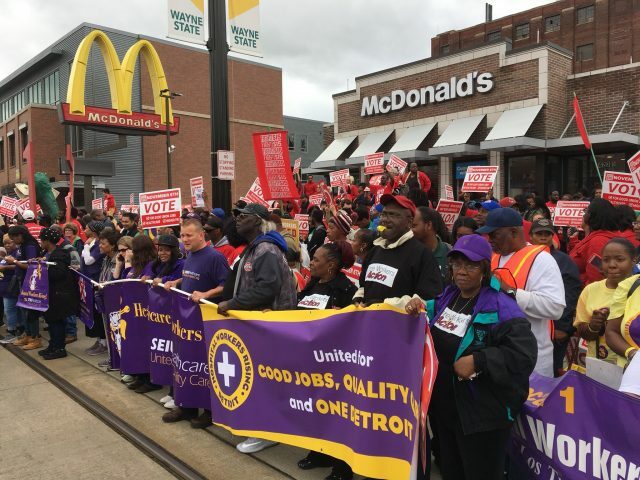 Emboldened by the growing momentum for $15 an hour, cooks and cashiers in Detroit stressed their demand for union rights at McDonald’s and across the economy. Holding banners reading “Unions for All,” hundreds of striking cooks and cashiers were joined by Detroit Metro Airport workers, downtown arena district workers and others in healthcare, child care and home care at the Detroit McDonald’s Tuesday to stress that union rights are a top priority for voters across the economy ahead of the November election. Michigan gubernatorial candidate Gretchen Whitmer, who met with striking fast-food workers in Flint, Mich., early Tuesday, expressed her support for their demand for union rights, and Michigan Attorney General candidate Dana Nessel, state Senate candidate Adam Hollier, and local clergy leaders joined Detroit workers at the strike Tuesday. The walkouts in Flint and Detroit Tuesday kicked off a wave of strikes by thousands of fast-food workers demanding union rights from their employers that will expand to other battleground states across the country Oct. 3 and 4. Cooks and cashiers will strike in Milwaukee Wednesday, followed by hundreds of fast-food workers in Chicago on Thursday, Oct. 4. As Chicago fast-food workers walk off the job, thousands of cooks and cashiers will strike Thursday in battleground states with key races in November including Florida, Georgia, Connecticut and California, demanding union rights in the $200 billion fast-food industry. As fast-food cooks and cashiers prepare to strike nationwide this week, thousands of workers from across the service economy will join the uprising, including in key 2018 battlegrounds. Higher education workers at Miami Dade College – Florida’s largest college – and child care workers across California will rally on Thursday, while hospital workers at the University of Pittsburgh Medical Center will walk off the job to protest efforts by powerful employers to undercut unions. 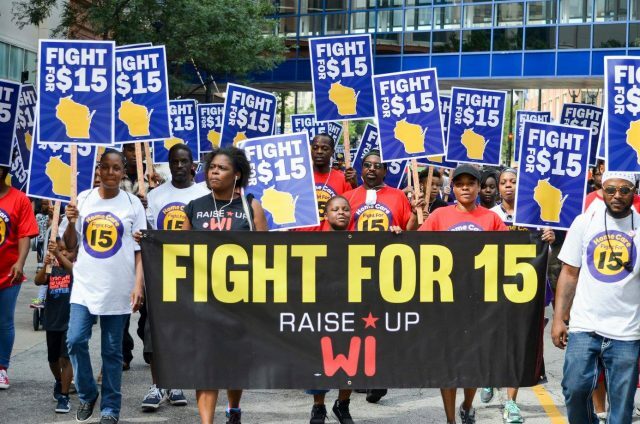 Beginning Oct. 4, workers in the Fight for $15 alongside union members across the country will head from the strike lines into their communities to lead 2018 election canvasses in swing states including Michigan, Wisconsin, Illinois, Georgia, California, Florida, Connecticut, New York, Pennsylvania, Colorado and Ohio where there are key races ahead of the November election. The demand for unions also grew louder overseas. 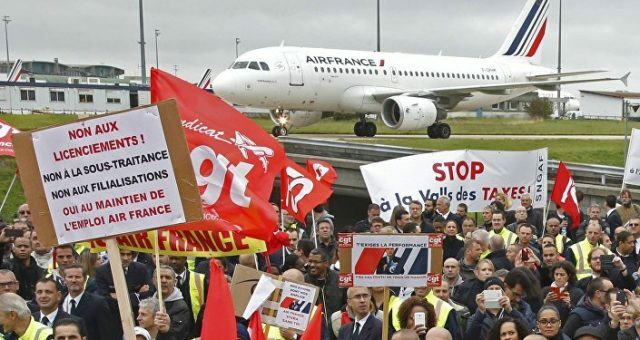 Workers at all airports in France went on strike Tuesday as thousands of airport service workers protested in the U.S. and across the globe demanding fair wages and union rights, rallying at 43 airports in 13 countries. McDonald’s workers in the U.K. plan to walk off the job Oct. 4 calling for 10 pounds an hour, union rights and an end to abusive “youth rates.” The strike will be the third and largest walkout in the past year by U.K. McDonald’s workers, who were inspired by U.S. fast-food workers in the Fight for $15. Cooks and cashiers in the U.K. will be joined by fast-food workers and fast-food unions from 16 countries. The strikes and canvasses follow a blitz of town halls and roundtable meetings workers in the Fight for $15 have held in 17 cities this year with members of Congress and state and local elected leaders focused on the need for lawmakers to make it easier for workers to organize in unions. As the election nears, support for unions is hitting record levels across the country. A survey by the Massachusetts Institute of Technology released in June found that Americans’ interest in joining unions is at a four-decade high, with nearly half (48 percent) of all nonunion workers in the U.S. saying they would join a union if they could. A recent study by the Economic Policy Institute shows the decline in union membership over the past few decades has helped keep wages stagnant. Another study from the University of Illinois at Urbana-Champaign found that higher rates of unionization led to higher wages not just for union members, but for all workers. Earlier this year, public school teachers launched a wave of strikes hitting red states spanning West Virginia to Oklahoma to Arizona and beyond to protest years of pay cuts and attacks by politicians against their union. And in August, working people in Missouri voted by an overwhelming 2-1 margin to repeal the state’s right-to-work law. A growing number of candidates are putting unions at the center of their campaigns this year – and in state after state, that support is propelling them to victory, including Conor Lamb in Pennsylvania, David Garcia in Arizona, and Richard Ojeda in West Virginia. Voice of Detroit is published pro bono. You don’t have to pay to access our stories. But there are substantial out of pocket costs associated with its publication. Currently we are running in the red, so any donation amount is much appreciated. Donate by clicking https://www.gofundme.com/VOD-readers-up. This entry was posted in Uncategorized and tagged FIGHTFOR15. Bookmark the permalink.